The Daily Rant: Sprinkle Of Seaweed, Anyone? When I was a kid growing up in New York, my mother went through a health food phase. 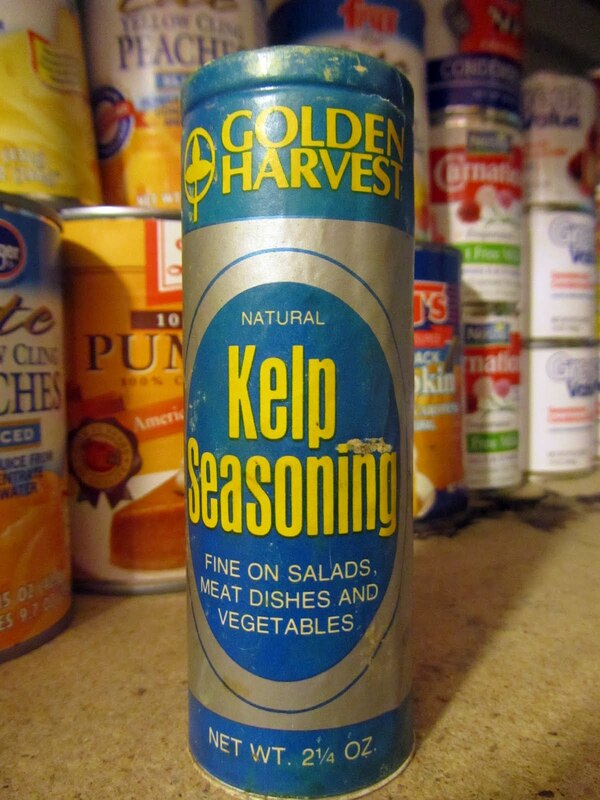 She served protein shakes, made lentil loaf and lentil burgers (her version of healthy meatloaf and hamburgers), ate Wasa Bread and used spices like this Kelp Seasoning. 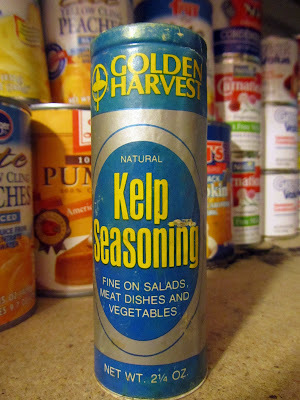 When I recently saw this Kelp Seasoning in my mother's pantry, I was transported back to that time. I almost fell off the stepstool I was standing on. Worse yet, I'd bet a month's income that it's the same exact canister we used to have in our spice cabinet back in the late seventies, early eighties. The labeling looks "vintage" and the sticker on the bottom says she paid sixty-nine cents. Dried herbs and seasonings lose their potency and flavor over the years, but this one still smells as disgusting as the last time I was unlucky enough to inhale its odor. I don't even recall what she used it for, I just know that sprinkling dried seaweed on anything can't be good. Traumatic childhood food memory. No wonder I eat Twinkies. 6 YEARS AGO: What’s It All About? aha... don't know what "Golden Harvest Kelp Seasoning" is, but I love furikake (dried and ground fish, sesame seeds, chopped seaweed, sugar, salt) on Japanese food. acquired taste, obviously, but you don't use a lot. it just adds body, it doesn't actually TASTE fishy. I assume you're not a big fan of sushi rolls? Paul: I'm not a fan of fishy tasting foods, even not of the Japanese variety. But I can see how the furikake might add to a dish's layer of flavor. I guess it's kind of like using anchovy paste or fish sauce in cooking. And I've never had sushi rolls.